1. Preheat the oven to 200°C, gas mark 6. Cook the moussaka according to pack instructions. 2. Meanwhile, halve and finely slice the red onion. Place into a bowl with the vinegar, olive oil, ouzo or pastis, if using, plus the fresh and dried oregano. Season and mix well. 3. Cut the tomatoes and cucumber into chunks, and scatter over a large platter with the olives. Drizzle over the dressing. 4. Cut the feta into thick slices and place on top of the salad or crumble over if you prefer. Season with black pepper before serving scattered with more fresh oregano leaves. 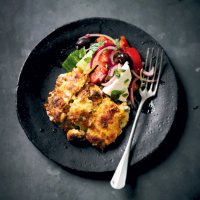 Serve before or with the moussaka.